The router packs 64mb Ram used for running DD-WRT firmware. As the other routers in this series the WZR-HP-G300NH has the AOSS one push button setup making the installation and setup a breeze. 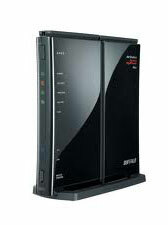 The router supports both N150 and N300, but it is not a dual band router as the big brother. As with all the other routers in this series the WZR-HP-G300NH runs DD-WRT firmware. This will allow us to connect to Unlocator (Yes that is their name) and hereby bypass the US only restrictions of . This is even a great solution for viewers in countries such as Canada that already have , but want to larger selection available at the US site. Devices such as the Apple TV, Roku Box, Boxee Box, Xbox 360, Playstation 3, Wii, Nintendo 3D, HD TVs, Blu-Ray players and set-top boxes do not have a build in VPN client. This is where the WZR-HP-G300NH comes in handy, as it will be able to create the VPN tunnel needed to unblock . The Buffalo router series is recommended by Unlocator for in router VPN connections. 3/5 Stars.The lack of dual band connectivity is a deal breaker for me. Having a lot of older devices in the household as well as new laptops running in the N-network, then the missing dual band decides it for me. Without the dual band you are forced to run at the speed of the slowest device on the network. Adding about $20 you will get the dual band connectivity and double the ram from the WZR-HP-AG300H – that is a no brainer to me.